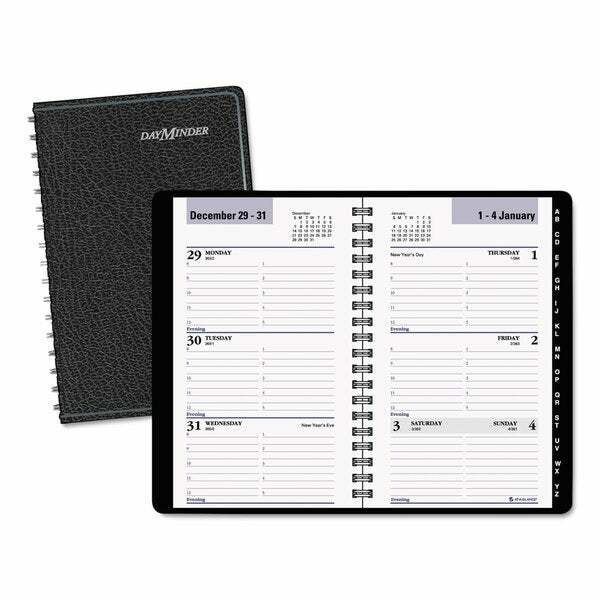 Compact size for your pocket or bag; plan your week with hourly intervals. One week per two-page spread; block-style appointments; current and future months reference. Tabbed telephone/address section. High-quality paper with superior ink bleed resistance. Size: 3 3/4 x 6; Page Color/Theme: White; Appointment Ruling: Hourly, 8 AM to 5 PM w/Evening Activities (Mon.-Fri.); Open Scheduling (Sat.-Sun. ); Edition Year: 2019. It doesn’t have a memorandum page for each month, not a memorandum space for each week. The pages are thin. It does St have a monthly calendar page. Altogether disappointing. I have been using this product for years. I love the "at a glance" feature.